Draw: November 9, 2016. Winner: APrime won 5 mBTC. Draw: November 10, 2016. Winner: M64GamingYT won 14 mBTC. Draw: November 13, 2016. Winner: donvinlander won 844 mBTC... новый рекорд!!! Next Draw: November 14, 2016. Winner: to be announced. Лотерея горшок ~ 700 Мб: Получить билеты! Выйграй $50 в Биткоинах в предсказании! Предсакажи в USD стоимость Биткоина на 17 декабря 2016, 11:00 PM UTC(03:00 МСК). -> Запости твоё предсказание в комментариях, поделись этим постом с другими! (1 предсказание - 1 персона). -> Предсказание заканчивается 10 декабря 2016, 11:00 PM, UTC(03:00 МСК). -> Победителем будет выбран человек, угадавший наиболее близко оригинальную стоимость 1 Bitcoin в USD на bitcoinaverage.com! Draw: November 14, 2016. Winner: rajapalak won 8 mBTC. Draw: November 15, 2016. Winner: Naoko won 7 mBTC with a Free Lottery Ticket. Draw: November 16, 2016. Winner: bankk won 6 mBTC with a Free Lottery Ticket. Draw: November 17, 2016. Winner: erikalui won 8 mBTC with a Free Lottery Ticket. Read the full story. Draw: November 29, 2016. Winner: donvinlander won 723 mBTC. Draw: November 30, 2016. Winner: Visions won 7 mBTC with a Free Lottery Ticket. Draw: December 1, 2016. Winner: Wilhelm won 12 mBTC. Next Draw: December 4, 2016. Winner: to be announced. Draw: December 4, 2016. Winners: #1: donvinlander 392mBTC, #2: DonvinTRIVIA 196 mBTC, #3: tor567 66 mBTC. Next Draw: December 5, 2016. Winner: to be announced. Начиная с сегодняшнего дня и по 31 декабря rollin.io проводит серию бесплатных новогодних розыгрышей лотереи. I check your Level the moment you enter. If you go up in level before the end of December, send me a message and I'll give you another ticket. 19 prizes totaling 646 mBTC (currently just over $500). Draw: December 5, 2016. Winners: #1: katerniko1: 6 mBTC (with a Free Lottery Ticket), #2: dtips 3 mBTC, #3: jekjekman: 2 mBTC (with a Free Lottery Ticket). Draw: December 6, 2016. Winners: #1 tor567 won 18 mBTC, #2 madcoin won 9 mBTC, #3 madcoin won 3 mBTC. Draw: December 8, 2016. Winners: #1 tor567 won 32 mBTC, #2 tor567 won 16 mBTC, #3 SergiuS won 6 mBTC. Draw: December 11, 2016. Winners: #1 SergiuS won 126 mBTC, #2 CASIO won 63 mBTC (with a Free Ticket), #3 IKWYDTM won 21 mBTC. Draw: December 12, 2016. Winners: #1 Humbertin19_ won 8 mBTC, #2 Humbertin19_ won 4 mBTC, #3 Humbertin19_ won 2 mBTC. Draw: December 13, 2016. Winners: #1 DolpinBot won 6 mBTC, #2 DolpinBot won 3 mBTC, #3 AtlantaSix won 1 mBTC (with a Free Ticket). Draw: December 14, 2016. Winners: #1 Darkbullie won 43 mBTC, #2 bapfu won 21 mBTC, #3 psonowa won 9 mBTC. Draw: December 15, 2016. Winners: #1 Darkbullie won 15 mBTC, #2 Wilhelm won 7 mBTC, #3 bapfu won 3 mBTC. Next Draw: December 18, 2016. Winner(s): to be announced. И я того же мнения. Кто ж позволит себя обыграть? Их для того и делают, чтобы заманить сначала, а потом развести по-крупному. Для азартных все сделано. А сегодня мне повезло в лотерее !!! Win $50 worth in bitcoins by predicting the bitcoin price! Our latest Caesars WINNERS - Weekly 1 Bitcoin in prizes! Draw: December 18, 2016. Winners: #1 BitLab won 73 mBTC, #2 Wilhelm won 36 mBTC, #3 hitava won 14 mBTC (with a Free Ticket). Draw: December 19, 2016. Winners: #1 Wilhelm won 14 mBTC, #2 Wilhelm won 7 mBTC, #3 bapfu won 3 mBTC. Draw: December 20, 2016. Winners: #1 ashitha won 35 mBTC (with a Free Ticket), #2 bapfu won 17 mBTC, #3 Darkbullie won 7 mBTC. Draw: December 21, 2016. Winners: #1 SergiuS won 40 mBTC, #2 Wilhelm won 20 mBTC, #3 lolgato won 7 mBTC. Draw: December 22, 2016. Winners: #1 maksosip won 18 mBTC (with a Free Ticket), #2 IIO won 9 mBTC (with a Free Ticket), #3 Humbertin19_ won 3 mBTC. Draw: December 25, 2016. Winners: #1 BitLab won 97 mBTC, #2 Bobr won 48 mBTC, #3 adri3000 won 17 mBTC. Next Draw: December 26, 2016. Winner(s): to be announced. Я снова выйграл... и снова 1-й приз!!! #2 Bobr тоже наш человек))) и все, кто выделены - наши ребята!!! Draw: December 26, 2016. Winner: tnecniv won 8 mBTC (with a Free Ticket). Draw: December 27, 2016. Winner: Ghostbystive won 7 mBTC. Draw: December 28, 2016. Winner: BitLab won 6 mBTC. Draw: December 29, 2016. Winners: #1 angayan17 won 9 mBTC, #2 Scarface4 won 4 mBTC, #3 somuchee won 2 mBTC (with a Free Ticket). Draw: January 1, 2017. Winners: #1 somuchee won 38 mBTC (with a Free Ticket), #2 timoteo won 19 mBTC (with a Free Ticket), #3 Humbertin19_ won 7 mBTC. Draw: January 2, 2017. Winners: #1 batakoluck won 16 mBTC (with a Free Ticket), #2 Humbertin19_ won 8 mBTC, #3 Humbertin19_ won 4 mBTC. Draw: January 3, 2017. Winner: Humbertin19_ won 3 mBTC. Win $50 by predicting the bitcoin price, last day! Draw: January 4, 2017. Winners: #1 Humbertin19_ won 15 mBTC, #2 Humbertin19_ won 7 mBTC, #3 BBaron won 4 mBTC (with a Free Ticket). Draw: January 8, 2017. Winners: #1 maksosip won 51 mBTC, #2 Dress won 25 mBTC, #3 ashitha won 9 mBTC (with a Free Ticket). Draw: January 9, 2017. Winners: #1 RemindMeLater won 45 mBTC, #2 RemindMeLater won 22 mBTC, #3 RemindMeLater won 8 mBTC. Draw: January 11, 2017. Winners: #1 RemindMeBank won 43 mBTC, #2 RemindMeBank won 21 mBTC, #3 RemindMeBank won 9 mBTC. Draw: Block 448200. 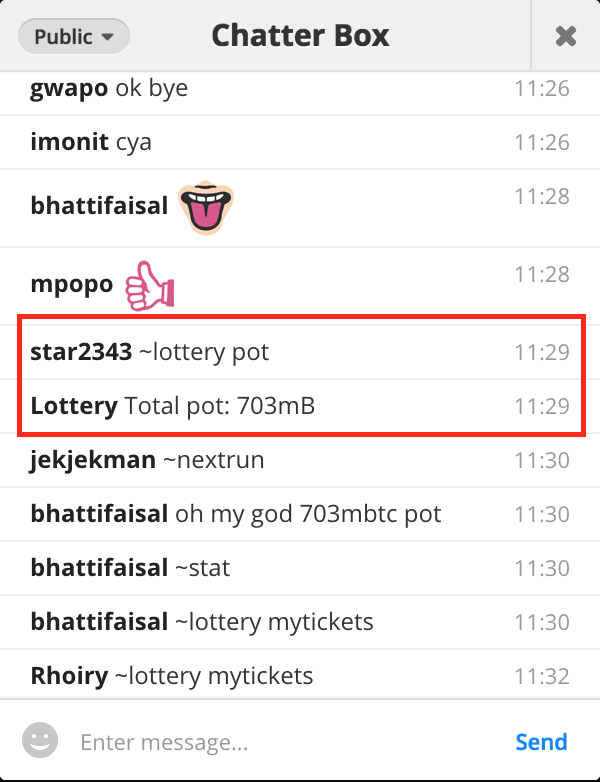 Winners: #1 lolgato won 208 mBTC, #2 BotMaster won 104 mBTC, #3 sairji won 35 mBTC. Next Draw: Block 448500. Winner(s): to be announced. Проект живой еще ? Есть хоть шансы выиграть больше 10 баксов или жесткий лохотрон как всегда ? Проект отличный! Если не жадничать, то 10 баксов в сутки взять не проблема! Draw: Block 448500. Winners: #1 sairji won 21 mBTC (with a Free Ticket), #2 gio999 won 10 mBTC, #3 BitLab won 4 mBTC. Draw: Block 449000. Winners: #1 IvanDrago80 won 36 mBTC, #2 31pikachus won 18 mBTC (with a Free Ticket), #3 FreeBit won 6 mBTC. Draw: Block 449200. Winners: #1 DolpinBot won 15 mBTC, #2 hitava won 7 mBTC (with a Free Ticket), #3 DolpinBot won 3 mBTC. Draw: Block 449500. Winners: #1 aRp won 16 mBTC (with a Free Ticket), #2 natsag3 won 8 mBTC (with a Free Ticket), #3 rolik2001 won 4 mBTC (with a Free Ticket). Next Draw: Block 450000. Winner(s): to be announced.